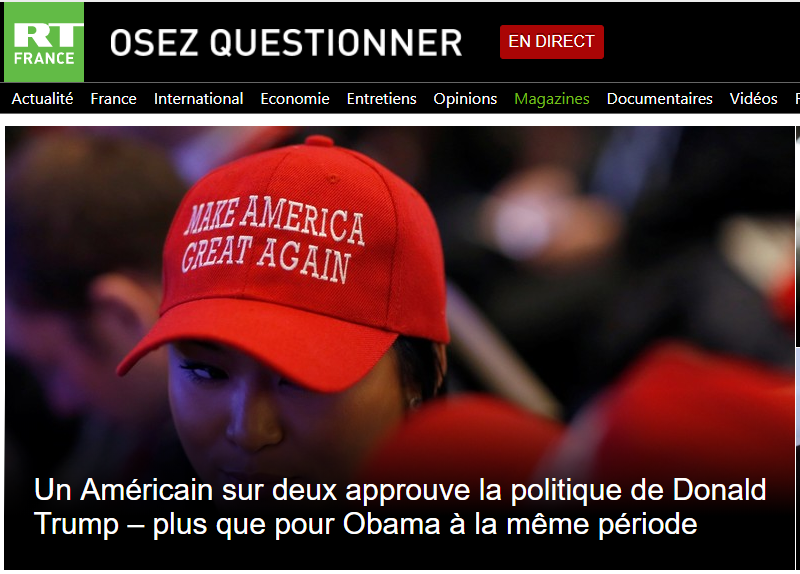 Above, the featured story on the french website of RT. It says that Donald Trump is more popular than Barack Obama at this stage of his presidency. The story relies on a single dodgy poll (Rasmussen) and a blissful ignorance of the respective state of the economy one year into each presidency. 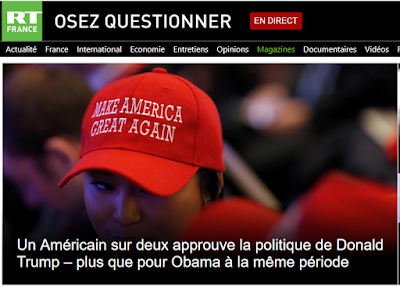 But the most tell-tale aspect of all: there is no sign of the story on RT's USA pages: too easy to debunk there, but the purpose is served by filtering to French readers that all Americans are crazy. A few things to note about this. One is a thriving business of eminent European people taking on high-falutin' assignments after their public service careers, which they hasten to add, is nothing as grubby as American style "lobbying." The second is the sheer number of people that got pulled into the Ukrainian economic orbit in the post-2004 era, when many long-time observers of the country would have advised that the corruption was so pervasive that it would be impossible not to get tainted, even with people skilled at the mental reservation that they were not lobbying. And the third is the biggest hole in the Trump-Russia narrative to the extent that it depends on Paul Manafort's connections: up until 2014, Manafort was lobbying for what Putin didn't want, that Ukraine-EU Association agreement. And after 2014, Manafort had lost his Ukrainian gravy train, and needed to start cashing in his properties purchased with money from his shady Ukrainian connections. That's precisely the legal theory in the latest Mueller indictment. In July of this year, the Great and the Good will observe the 23rd anniversary of the Srebrenica massacre. They will do so with their best Pharisee long faces and proclaim Never Again. This, as history repeats so precisely, a Russian-backed militarized regime committing atrocities against Sunni Muslims, this time in Ghouta, Syria. It's not just in the USA where the teenagers are going to have to give up on the prospect of their elders ever doing anything. Rather than jealously guard the policy proposals the president will announce in the speech — lest they leak — the White House has already rolled them out on social media. That strategy scooped the press and generated millions of retweets well before the newspaper articles and television reports were even produced. Any second thoughts on the strategy of enhancing the credibility of social media-propagated items at the expense of mass media outlets? I’m writing this to you from America but not just any America. I’m in an “all-you-can-eat” hotel in the bizarre planet that is Disney World, Orlando. Disney World isn’t just any America. This is the place that blue-collar America comes on holiday. An “all-in” week here is part of the American dream. The people who make the pilgrimage are the people who voted for Donald Trump. Disney World tickets begin at $100 per person per day, and given the time constraints, that's actually $100 per person per day per park (there are 4 parks). All the saving in the world is not going to get his notional Trump voter family a week in Disney World, let alone the flights and hotel in Orlando. The enemy of the working man isn’t Donald Trump but the professional, quasi-clerical aristocracy, who look down their noses at him for holidaying in Disney World, while they hang out in a similar la la-lands like Martha’s Vineyard – Disney World for people with degrees. Those Martha's Vineyard vacationers might indeed look down their nose at people who go Disney World -- in summer. They take the family to Disney World in Fall, Spring, and Winter, when the central Florida weather is more agreeable (and thus everything is pricier). People will look at the ashes of Westerburg and say, "Now there's a school that self-destructed, not because society didn't care, but because the school was society." Now that's deep. MOSCOW — Four Russian nationals, and perhaps dozens more, were killed in fighting between pro-government forces in eastern Syria and members of the United States-led coalition fighting the Islamic State, according to Russian and Syrian officials. A Syrian military officer said that about 100 Syrian soldiers had been killed in the fighting on Feb. 7 and 8, but news about Russian casualties has dribbled out only slowly, through Russian news organizations and social media. Much about the attack and the associated casualties has been obscured in the fog of war. For reasons that remain unclear, Syrian government troops and some Russian nationals appear to have attacked a coalition position, near Al Tabiyeh, Syria. Since Vladimir Putin's latest Mission Accomplished moment in December (there have been three), the situation in Idlib and Damascus suburbs has gotten even worse, the regional tensions have escalated, and now, Russian casualties on the ground are catching up to the actual scale of the Russian engagement. It shouldn't take a lot of effort to hold Russia, Venezuela, and Syria to the same standards as other countries are held, but there's a class of people out there who revel in the differential treatment. And who like to watch RT. The same year, the Russians also approached Ibrahim Jathran, a militia leader who controlled Libya’s key oil ports before General Haftar. United States Navy SEALs had recently boarded a North Korean-flagged ship and disrupted a plot by Mr. Jathran to bypass Libya’s government and sell oil directly on the international market. Two of Mr. Jathran’s top deputies, who asked that only their first names, Osama and Ahmed, be used, for fear of reprisals, described how the Russians then stepped in with a “really amazing” proposal to help Mr. Jathran sell the oil — and arm his militia. The Russians, Osama and Ahmed said, would market the crude oil, moving it through Egypt to Russia. Mr. Jathran would be paid in weapons for the first six months, and in cash thereafter. “The weapons included everything we have, plus armored cars, antiaircraft missiles, heat-seeking shoulder-held weapons, light weapons and comm gear including Hetra wireless,” Osama said. The end of the tale is that while the oil-for-weapons deal didn't get done with this particular militia, it eventually got done with the Benghazi-based forces of Khalifa Haftar. The sad fact is that there's nothing conceptually new about any of this. Natural resources used to finance weapons, which prolong conflict, which deplete the natural resources so that they can't benefit the people, so there is more reason for conflict. That's what the term "conflict diamonds" was meant to capture. But when Russia plays exactly the same game, it's portrayed as brilliant strategic moves by Vladimir Putin, and a lot of war critics go very silent. Since we know how this story of resource-fueled conflict ends -- it doesn't -- they'll have to be silent for a long time. 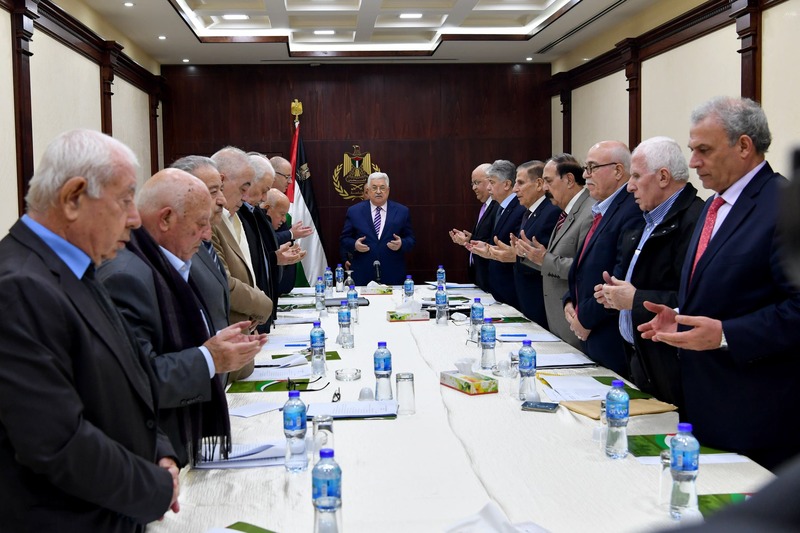 A meeting yesterday of the executive committee of the PLO in Ramallah, West Bank. The meeting decided on further foreign trips for Mahmoud Abbas (centre) to give speeches about Jerusalem. The basic question hovering around the controversial manufactured "memo" is why the FBI was so interested in Carter Page within the scope of a foreign intelligence investigation. It's been known for a while that Page was keeping some strange company -- in the old days of espionage, he would be the kind of figure popping up in places like Istanbul, Tangier, and Vienna. Except that he was still popping up in Vienna. Here he is describing a November 2014 visit to Vienna, in the course of remarks praising Austria's neutrality and saying that Ukraine would benefit from the same accommodation between Russia and the West. Ironically, the Austrian economy has suffered a disproportionately severe impact from the sanctions imposed by the U.S. and E.U. in 2014. The effect of sanctions levied on Russia have severely punished some of Austria’s largest financial institutions, including Raiffeisen Bank International. Although banks today represent almost half of the total market capitalization of the Vienna Stock Exchange, they stand at the forefront of today’s economic tumult given the prominent role they have played in financing Ukrainian development. As a primary example, this unnecessary collateral damage has been particularly great in the case of Raiffeisen which holds a top five market position in Ukraine with loans of 2.9 billion Euro, 713 business outlets and 2,962,732 customers. Why so much emphasis on Raiffeisen and the impact of sanctions against Russia on it? Maybe there was some lobbying involved. But Raiffeisen also has a bit part in Donald Trump's finances. Raiffeisen was the lender for Trump Tower Toronto -- launched in 2002 but only finished 14 years later, bankrupt, and no longer bearing Trump's name. In fact, Trump was never an investor in the project -- he collected fees while putting in no money -- but that subtlety was not clear to all the other investors, who lost their money. Anyway, the point is that Trump's serial bankruptcies had made him toxic to most American lenders, so that put him in a relationship with German and Austrian banks that had opaque ties to eastern Europe and Russia. A world that includes a need for no-questions-asked movements of money into solid investment vehicles. Like property. In turn, a trail that Russian intelligence services might like to keep an eye on. Which in turn might pique the interest of other intelligence services, including the fabled Five Eyes, who might notice a recurring character like Carter Page. In the spring of 1997, Michael Isikoff, a reporter for Newsweek and a coauthor of this article, first met Linda Tripp. At the time, Isikoff was investigating Clinton's alleged relationship with yet another woman. The twists and turns of Isikoff's reporting are complex, and normally Newsweek would not detail the behind-the-scenes work of its own reporter. But as will become clear, Isikoff's actions had an unavoidable impact on the story as it played out. The Carter Page FISA application also cited extensively a September 23, 2016, Yahoo News article by Michael Isikoff, which focuses on Page's July 2016 trip to Moscow. - This article does not corroborate the Steele dossier because it is derived from information leaked by Steele himself to Yahoo News. The Page FISA application incorrectly assesses that Steele did not directly provide information to Yahoo News. If Britain does remain part of the EU after all this, it will be because, in its present state, it is simply incapable of leaving.